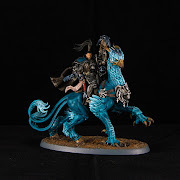 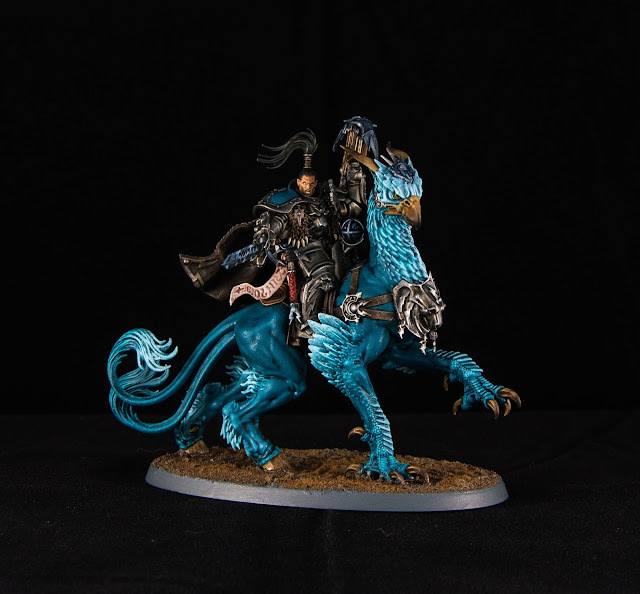 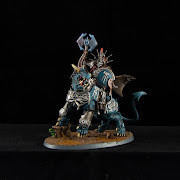 Well well well, I recently won a two-months local AoS tournament using my Asheaters and it was crazy! 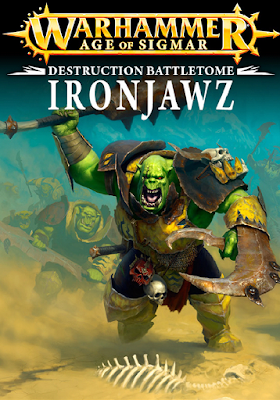 Although Ironjawz don't have so many army composition choices, and lack ranged weaponry altogether, they are a quite balanced force in its own right, good at winning by points and objectives, very good in a defending position but absolutely brutal if attacking. Here we are going to see their Battletome, that is a good one in fluff and background as well! A lot of informations are included in the first section of the book. 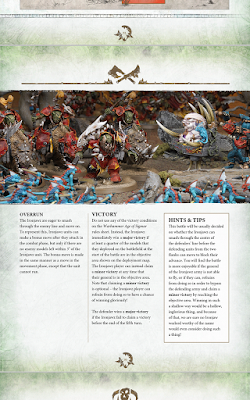 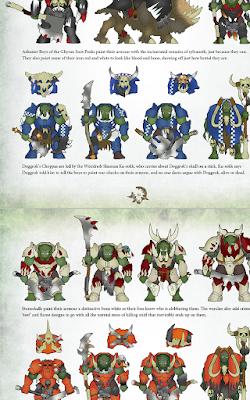 You get fluff and backgrounds, as well as some lifestyle examples for the new GW's Orcs (actually Orruks! 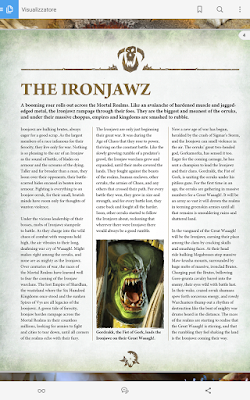 ), Ironjawz. 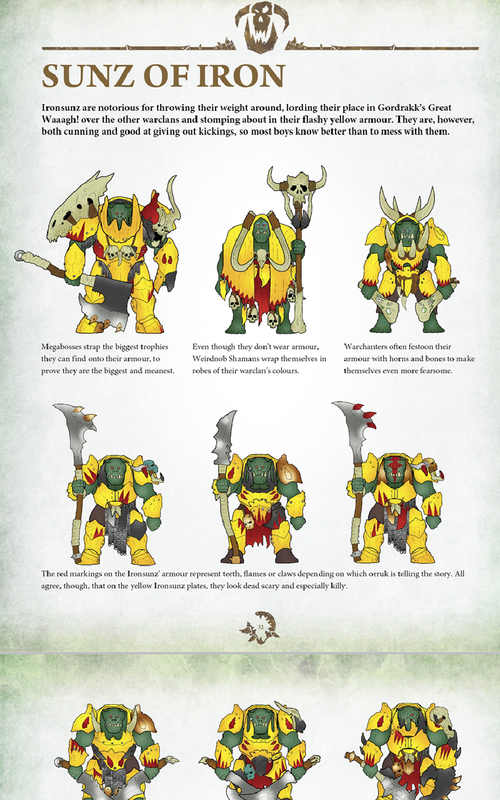 They are basically the bigger and more serious brothers of the previous greenskinz that wandered Old World's Badlands. 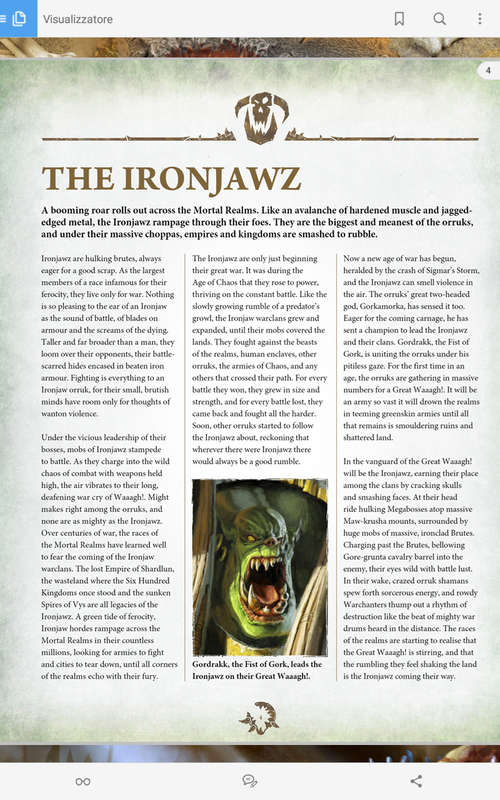 The dark humor concerning old orcs has remained the same, Ironjawz are stupid hulking creatures that aim to WAAAGH! 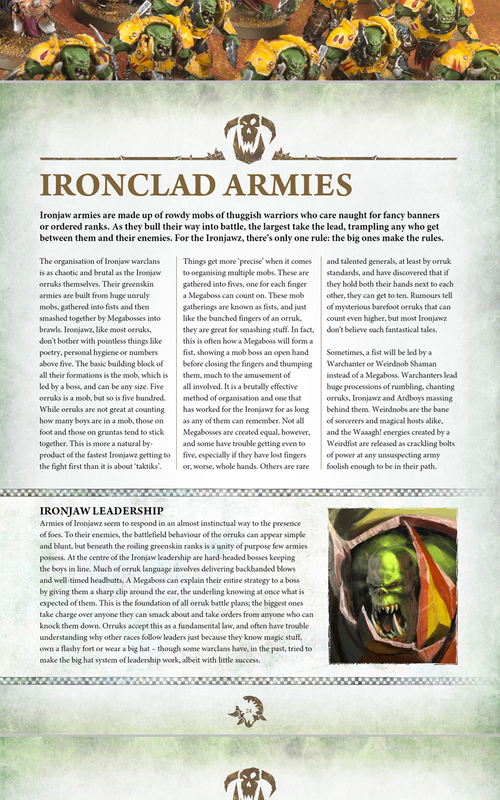 everything in their way but now thay are a step ahead... able to form alliances or to enstablish durable warclans, each with their own traditions of warfare or folklore, they lend themselves much better to different setting and stories. 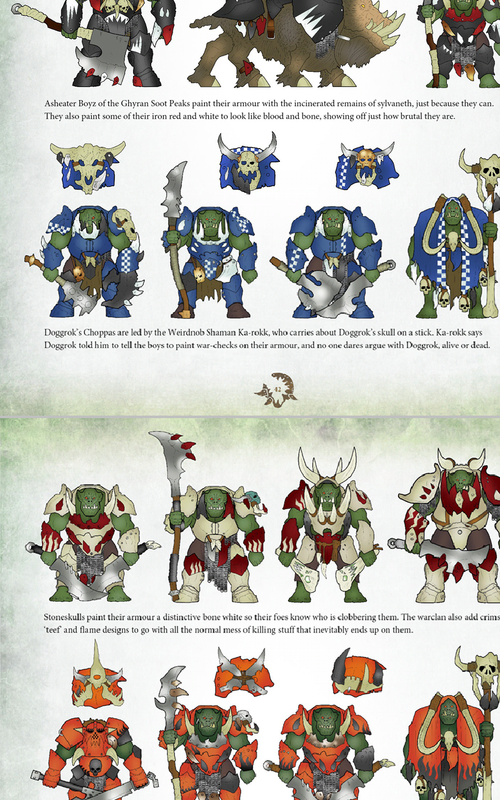 One thing that really makes them different from old orcs is religion. Of course Old World's orcs believed in Gork and Mork too but now it's different. 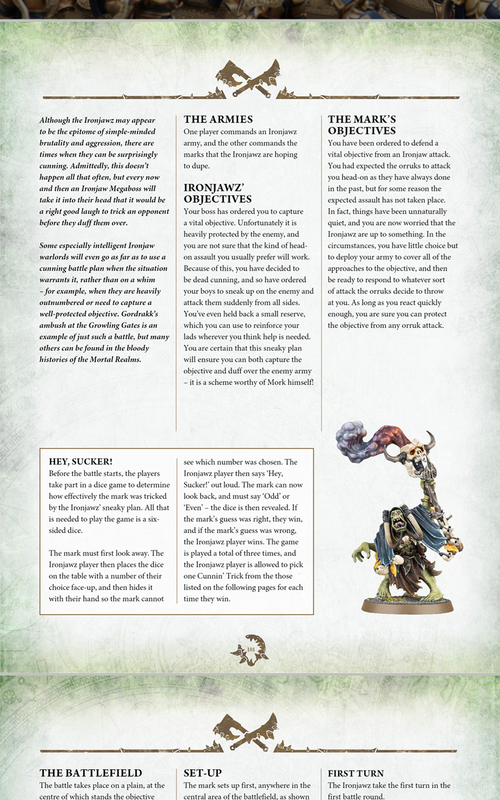 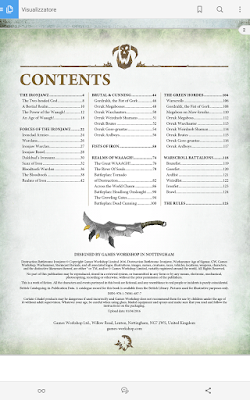 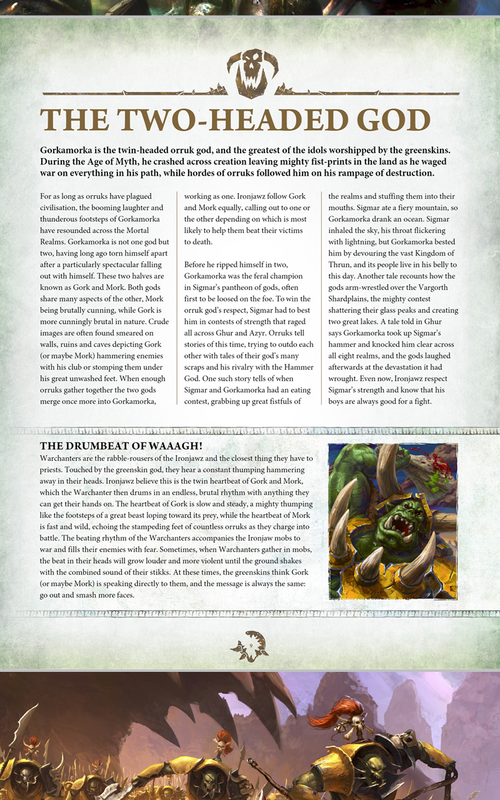 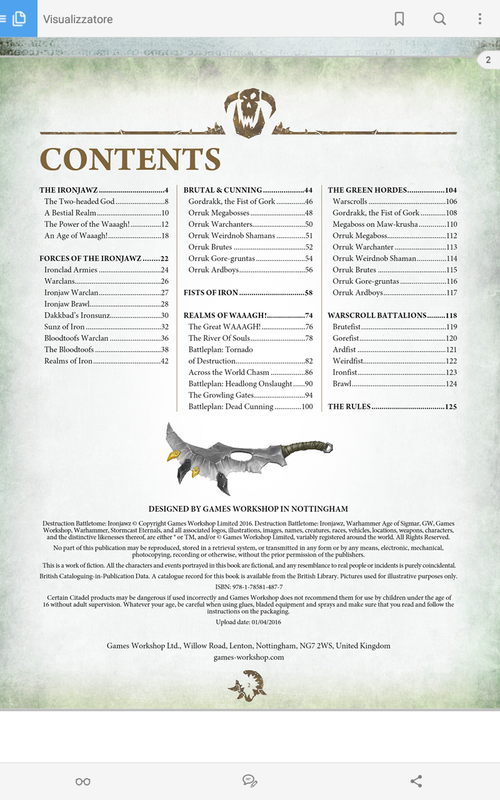 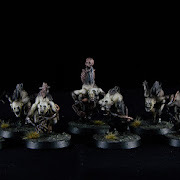 Warchanters, the closest ironjawz figures to a human priest, are the beating voice of Gorkamorka, the two headed god that once fought in the weak divine alliance of Sigmar; Weirdnob Shamans are able to channel the Green Energy that comes from the deity, in their credention, and talk about a Great Waaagh!, the biggest and most brutal ever seen, that will roll across the mortal realms leaving only ashes in its wake... but the main point is that this immense green ocean of slaughter will be guided by a Chosen from their divinity, and He will rally all Warclans and all of Gorkamorka's worshippers; and these are unknown concepts for the short-sighted orcs of past ages. 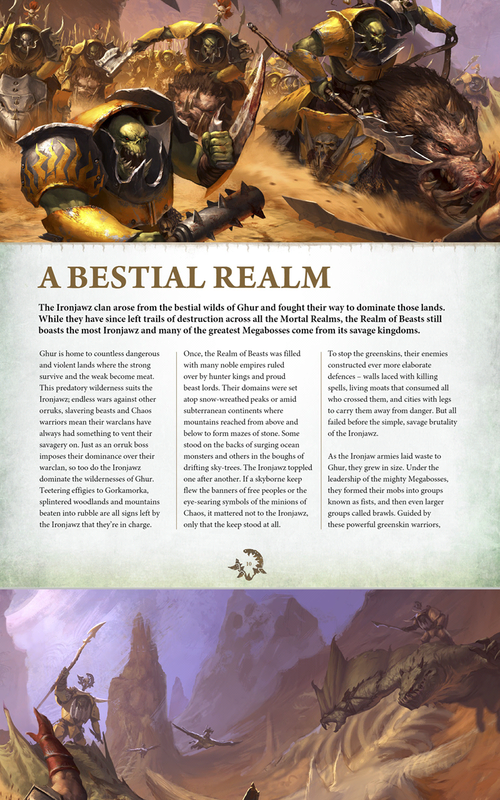 Gorkamorka is now the God of War, and bestial and cunning kinds are gathering under his Chosen banner, such as powerful Ogors from the Beastclaw Tribes from the north. 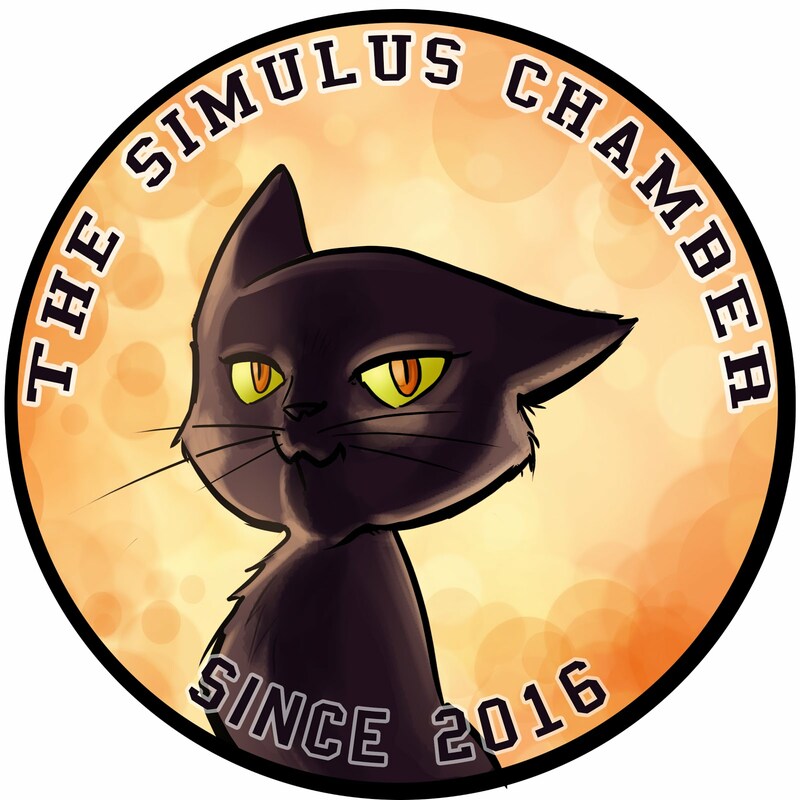 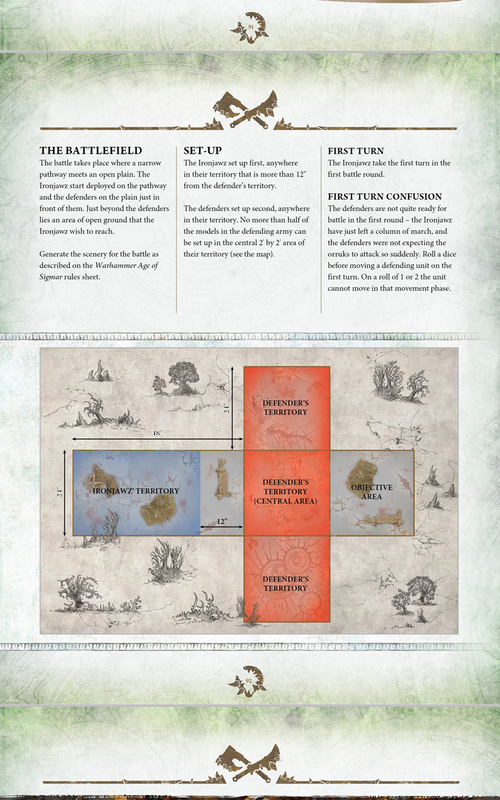 They are basically nomads and dwell in the same place only for a matter of war... if a place is likely to provide them an everlasting battle, well, they'll set up. 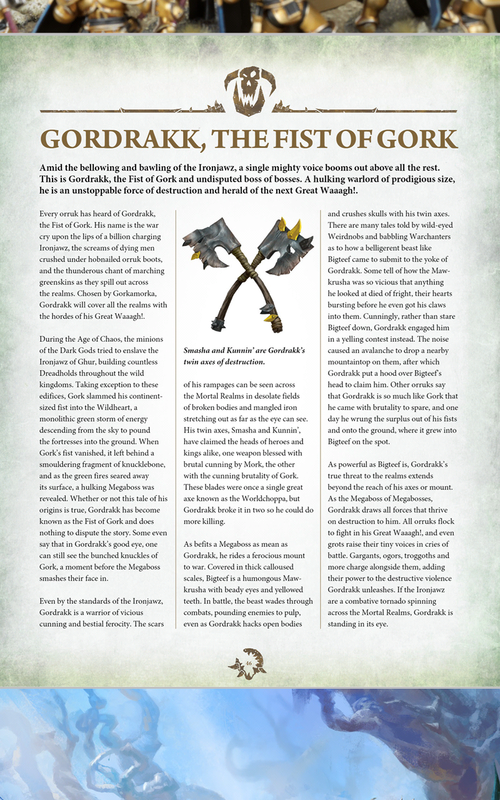 They don't normally use goblins to forge armors and weapons and they don't use things they previously plundered but instead forge their equipments using a rudimentary metallurgy. 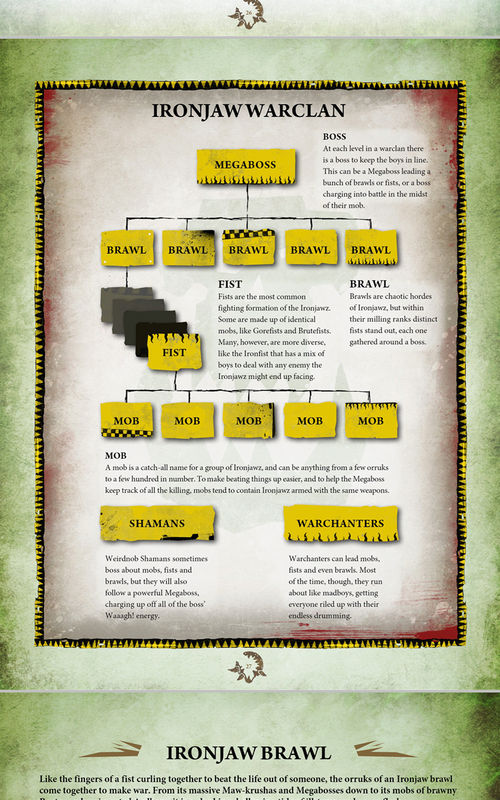 The Warclan's fabric presented in the tome is beautiful. 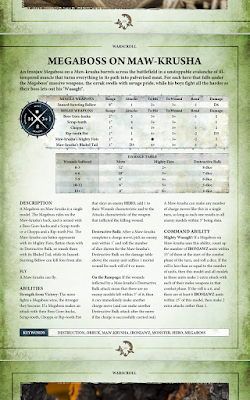 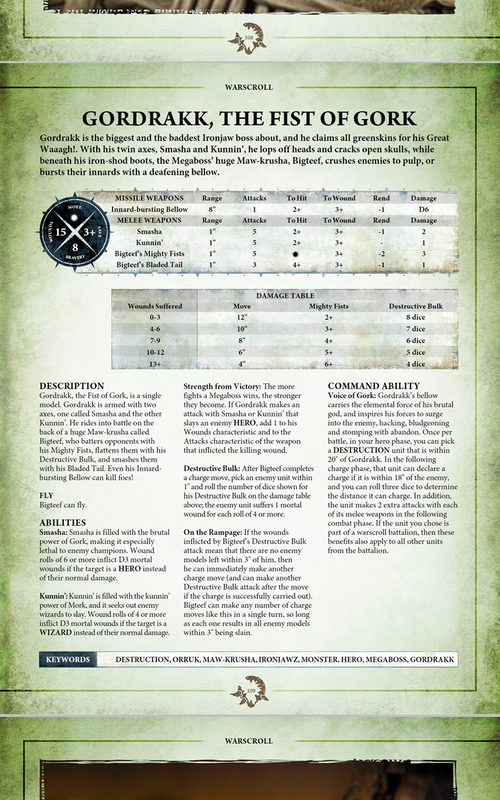 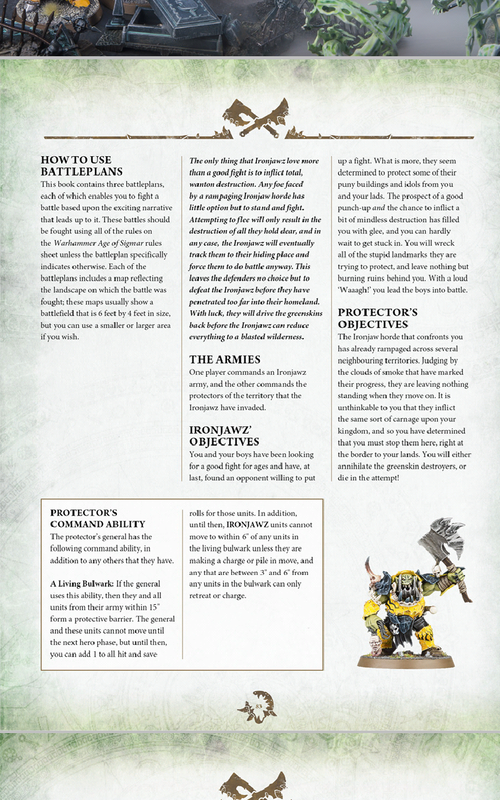 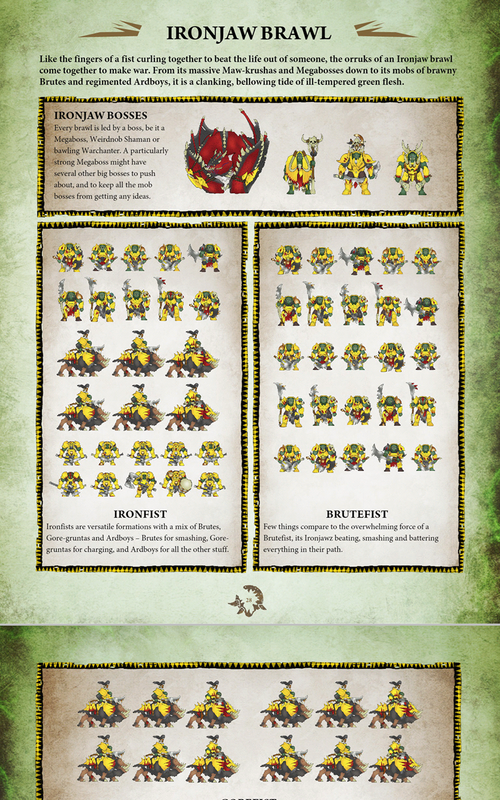 I am a lover of heraldic stuff as well military structures and when making the background for my Ironjawz I found this section very helpful. 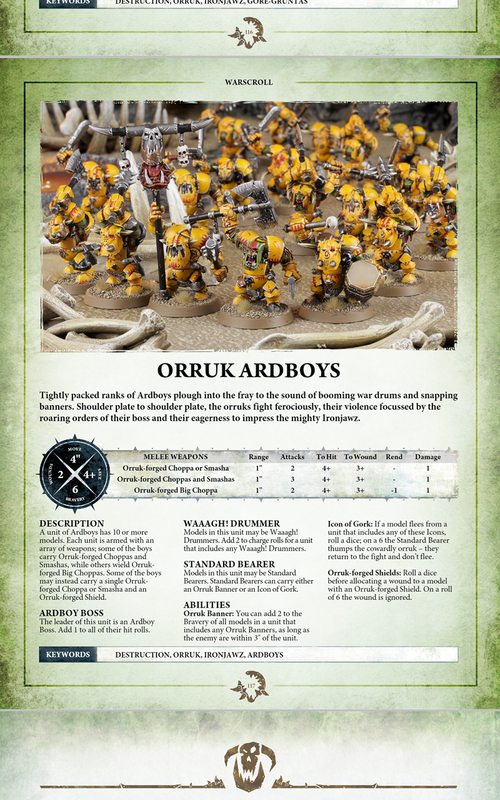 Obviously the Warclan presented in depth by GW writers is Ironsunz; those big guys in yellow that resemble something 40k-ish in-between Imperial Fists and Thaka's big meks. 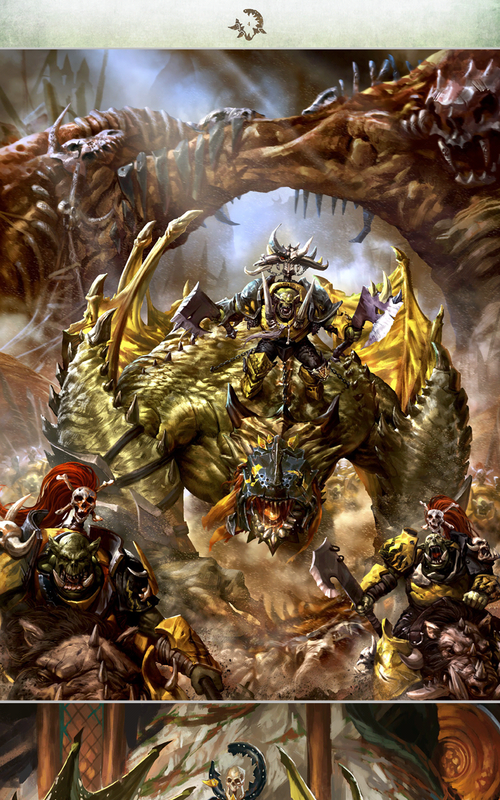 Ironsunz: all of the above in the yellow armor. 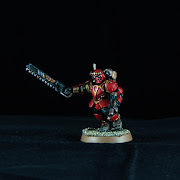 Bloodtoofs: red version of the first presented they have few main characters well presented in the 4th book of the Realmgate Wars, All-Gates. Basically the first two tribes are the closest to Gordrakk, Fist of Gork, and they are from Ghur, realm of the beasts and Ironjawz's main settlement. 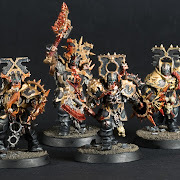 Asheaters: oh here we have my big buddies in black armor! 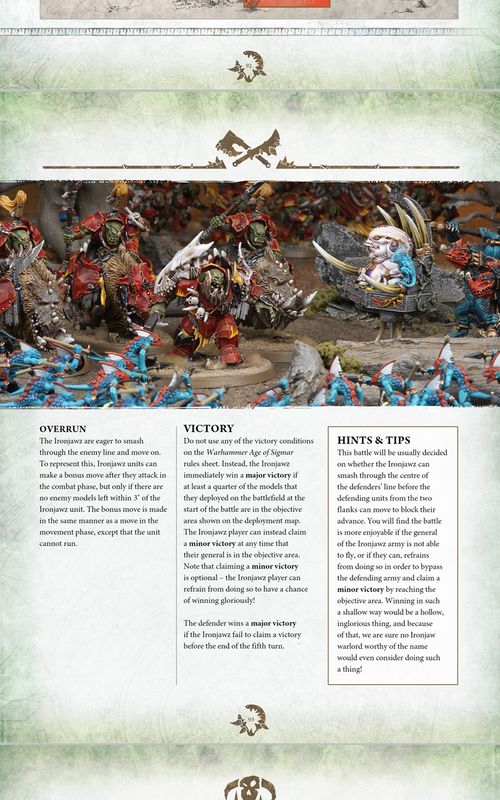 I created to lead them a megaboss on maw-krusha, Marnaldur Gaze of Mork and an entire background starting from gw's guidelines. Doggrok's Choppas could definitely be my second choice after Asheaters, I love their weird lore and their blue motley armors are fantastic! Their leader is, strangely, a Shaman called Ka-rokk, cunning enough to convince all the other orruks in the clan that their former megaboss, Droggrok, dead many years before, is still sending orders to him from the otherworld... of course to corroborate everything he's carrying the megaboss' skull on his stick, sometimes talking with it, too. 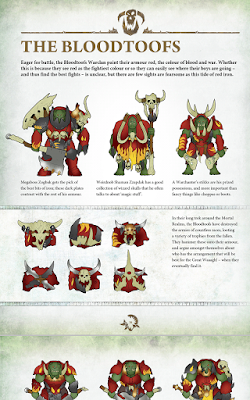 The remaining three clans are the Stoneskulls, painted in bone and red, the firselovers and starters Zedek's Weirdladz in orange armor directly from the Wraithbone's factory of Craftworld Lugganath and Skybasha in full silver and red. 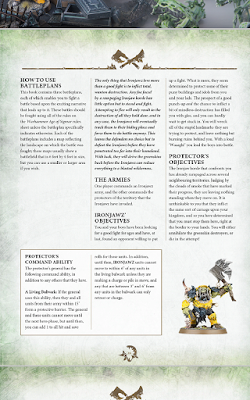 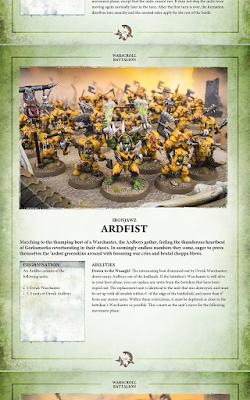 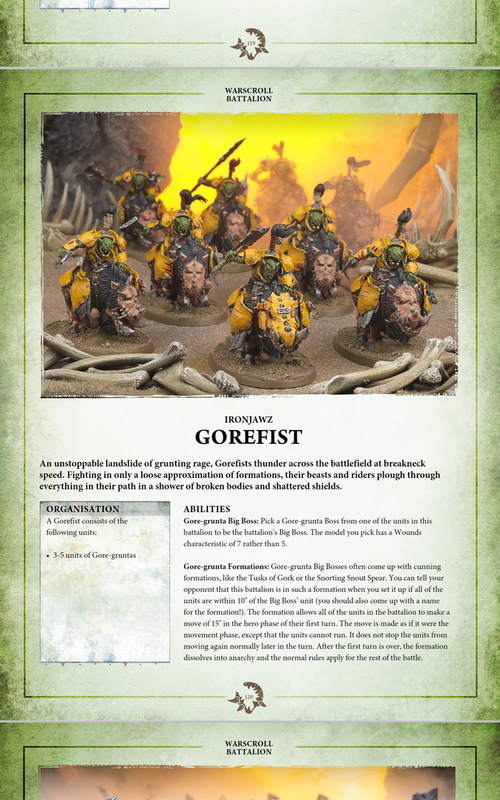 Descriptions for the mighty Fist of Gork, the orruk himself charged to guide the Great Waaagh! and destroy e v e r y t h i n g in their way, Gordrakk. 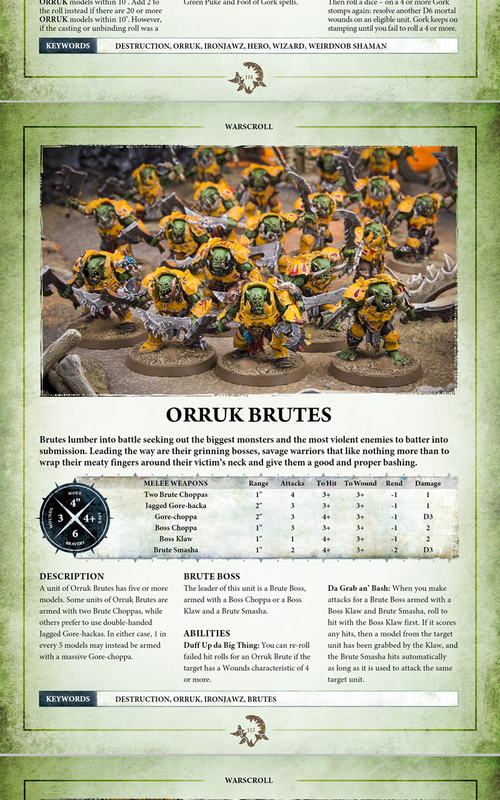 Another important point is hidden in this section to separate the Ironjawz from their older cousins and accost them to a more evolute figure of orc: all the Shamans in the Eight Mortal Realms are talking about Gordrakk and urge other Ironjawz to join the party. 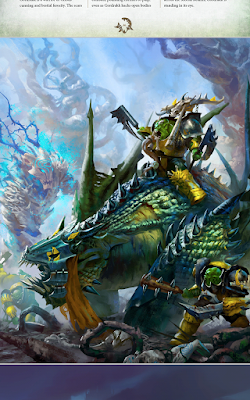 Incredible to know, even from other realm, megabosses are accepting the leadership of Gordrakk just following shaman's advices and Gorkamorka's signs... for the first time EVER orcs will gather under the same banner, and this is absolute havoc for all the others. 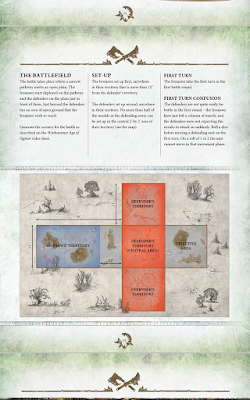 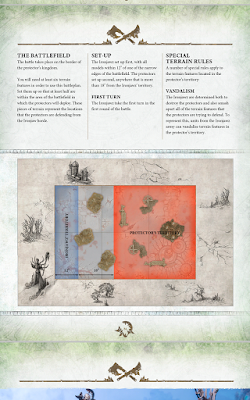 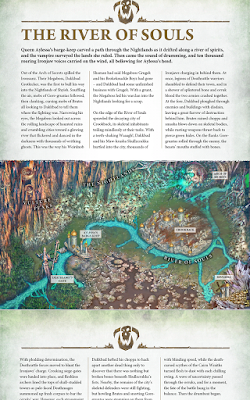 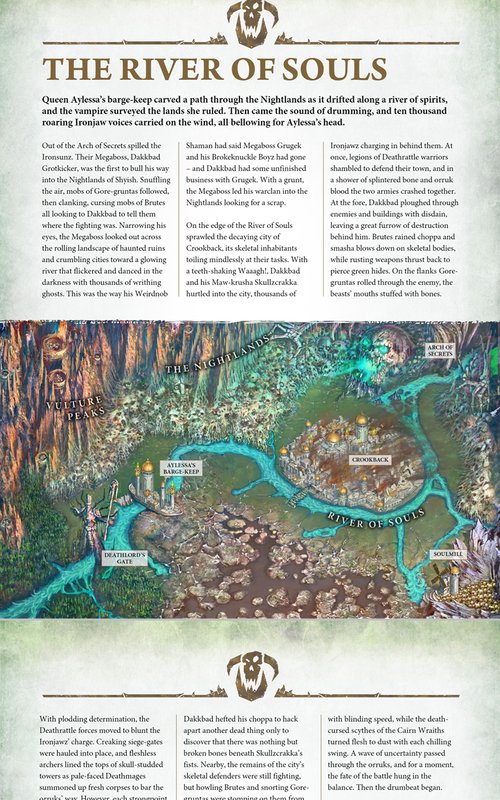 Three Battleplans are presented in the tome and their setting is something incredible. 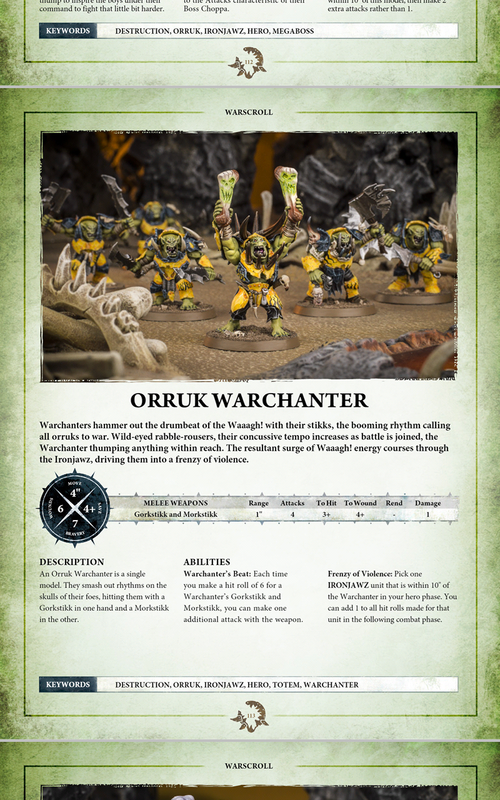 For all those who keep saying that AoS is without background: it's time to open up your eyes, folks, because AoS books are great. You got maps, names, narrative just for every single battle. 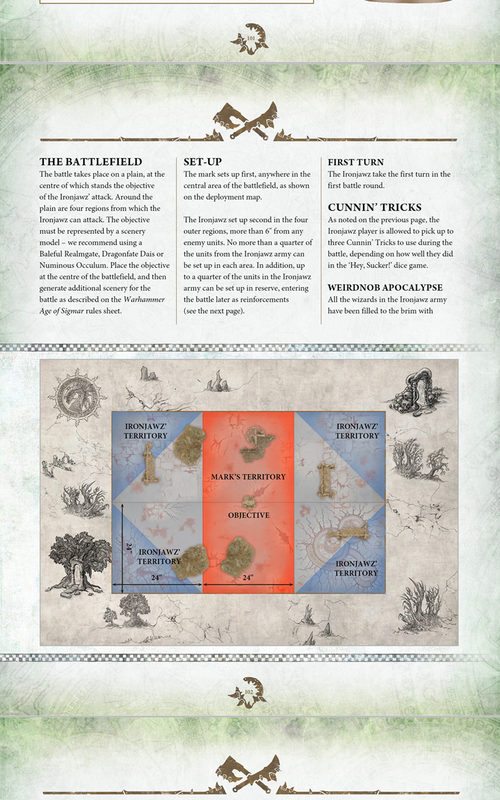 First battleplan featured, Tornado of Destruction. 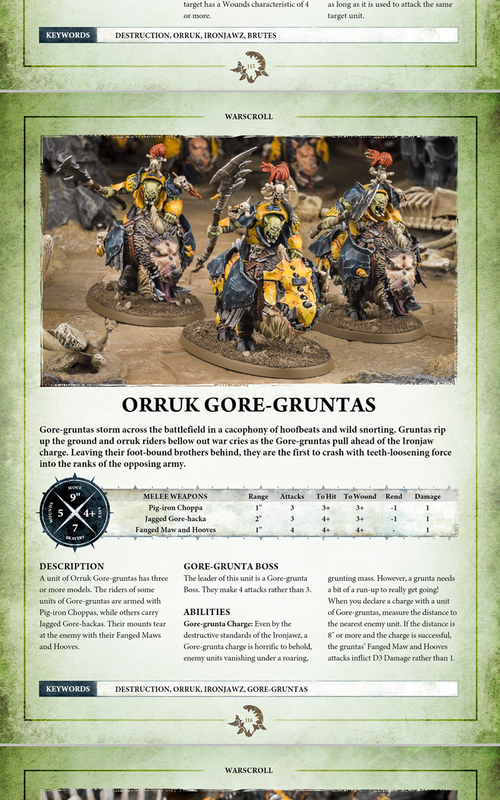 The first unit to analyze is Gordrakk. 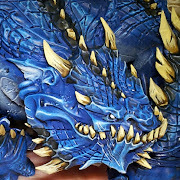 For his 700 pts he is a very colossal entry in battles of all sort. Deadly against every kind of enemies but havoc against heroes and mages his main point is, however and due to his very high price in points, his one-time command ability: Voice of Gork. 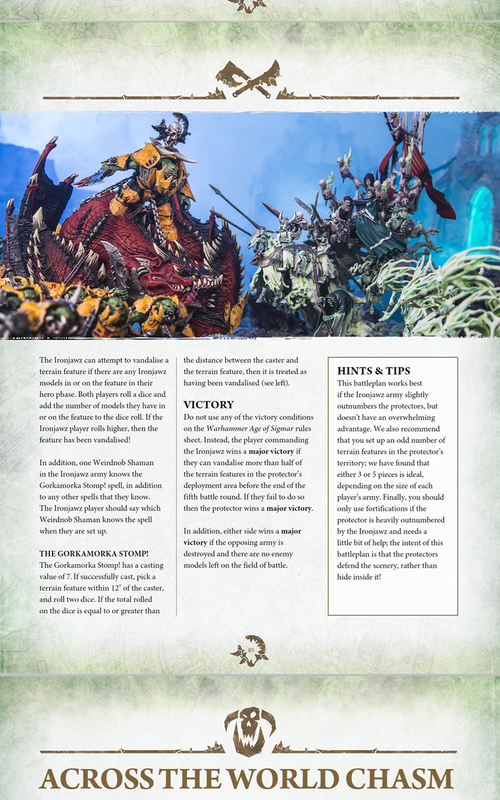 Basically the only tactic you can use, or you want to use if playing Gordrakk himself is charge and destroy, or die trying. 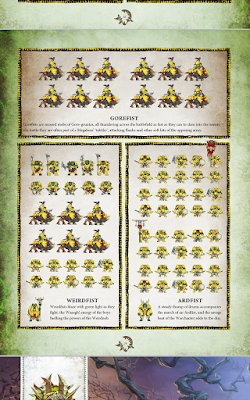 The ability make ONE unit within 20 inches of him to roll three dice instead of two to charge and adds two extra attacks with each profile of weapons of that unit, but if the unit is part of a Battalion every unit in the battalion is going to share the same benefits. 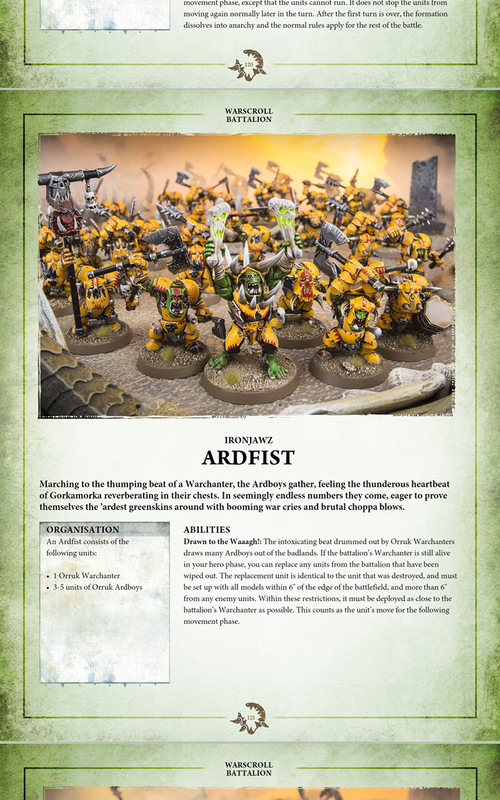 That's crazy, considering the double extra movements you gain in the hero phase for Destruction Grand Alliance bonus and chosing the Ironfist Battalion, you litterally can charge with all your army in the very first round making so many attacks near to madness. No-name Megaboss on Maw-Krusha is almost as deadly as Gordrakk but you need to protect him; even if you can arrive with some of your units in CC the very first turn you don't really want that your big piece of 520 points and general ('cause you have to give him command, he's riding a damn megaball of spines and hate) die so early. Keep him safe and let him attack later in the battle, let him attack weak units and erase them any time and try to use his command ability, Mighty Waaagh! 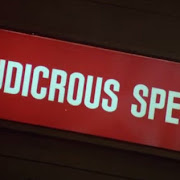 as many times as you can. Second line commander, Megaboss on feet is a good choice to mislead enemies attacks, he is tough (7 wounds and save 3+) but expendable for 140 points. 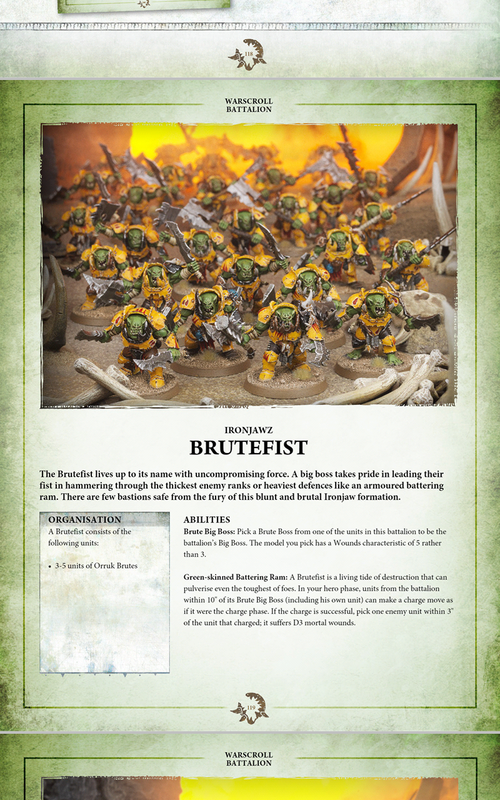 However his best position is just behind brutes, because he makes them reroll 1 to hit against any enemy. Warchanters are dangerous used in combo with Waaagh! 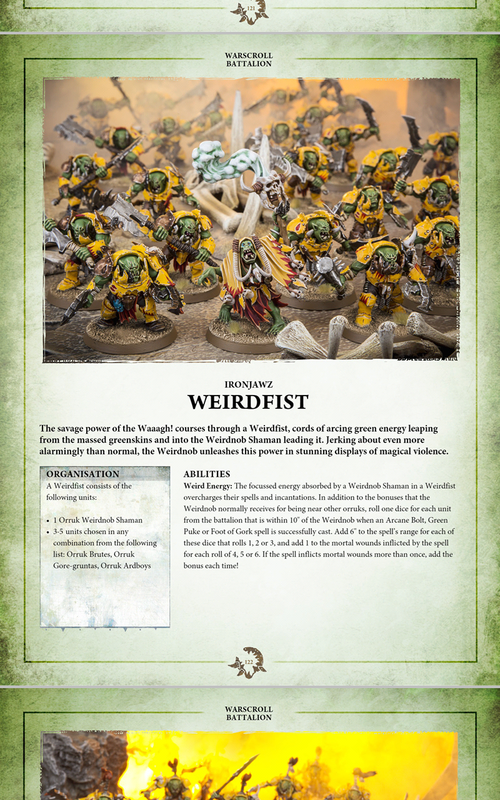 and Great Waaagh! 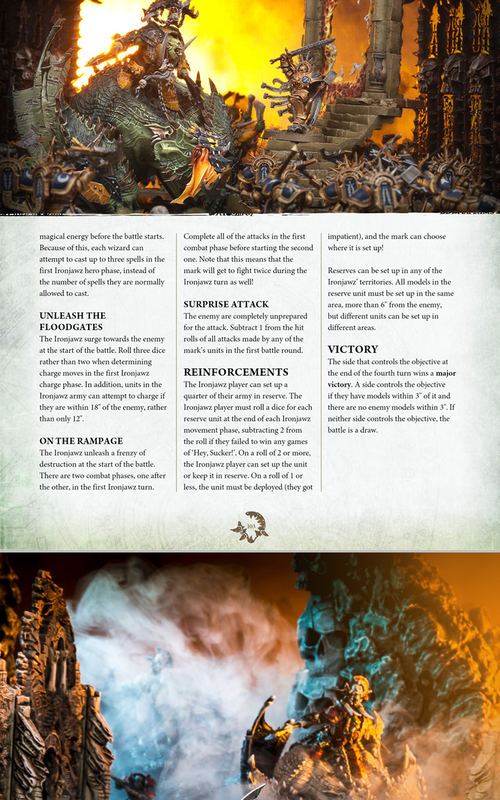 command abilities... when you have a unit that makes 40 attacks 2+ 3+ with a rend char of -1 you can be sure to explode any resistance. 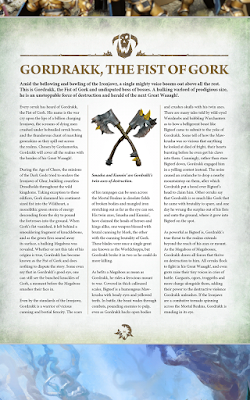 Use the warchanter's ability on a big unit, full, if possible, of Gore-Gruntas in the same round of a Waaagh! and send them against the biggest boys of your enemies... and see him weeping right after. 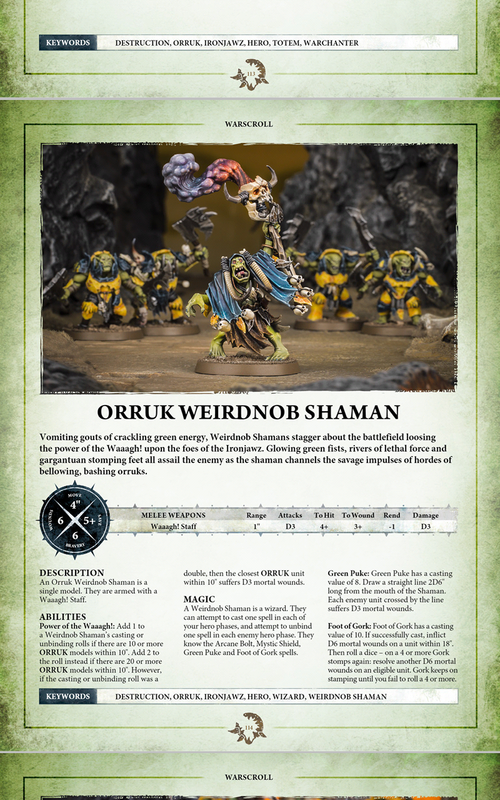 Ironjawz have a very good magical compart; Weirdnob Shamans are cheap (120 pts) and strong; they know 4 spells and can buff your units adding 1 to the save rolls or attack the enemies with a plethora of destroying measures: keep one between as many orruks as you can and you'll have certainty to cast every spell you want, cause he's going to add 1 to result of casting or unbing spell for every 10 orruks within 10" of him. 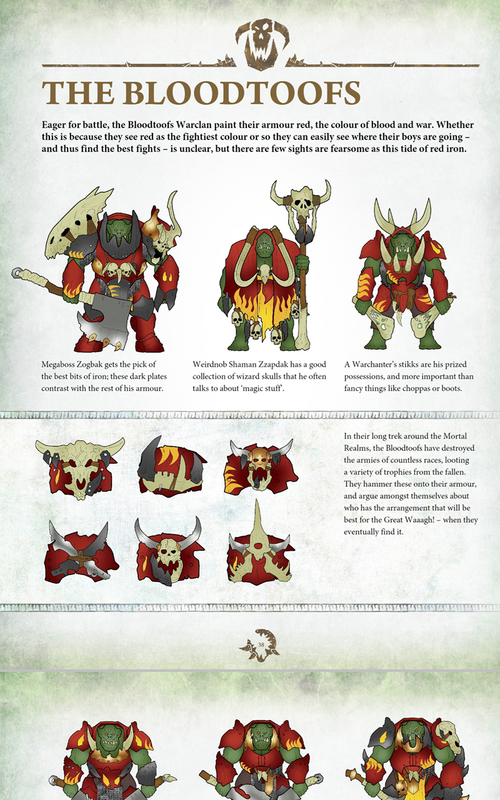 I suggest to use his Arcane Shield on your general on Maw-Krusha or on the unit that you use in the first turns as a battering-ram and save his best, like Foot of Gork that makes d6 Mortal wounds on a target unit and on 4+ jump again, even on the same unit, and so on until you miss the roll, for the last turns if you are losing. 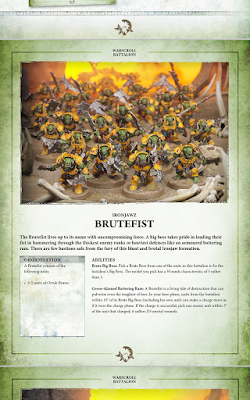 Brutes are maniac against heroes and monsters... they reroll to hit against units with 4 or more wounds per model and their weapon set-up is illogically overpowered for just 180 points. 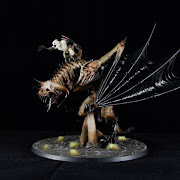 5 models of them could blast a Stardrake in a turn, maximazing. 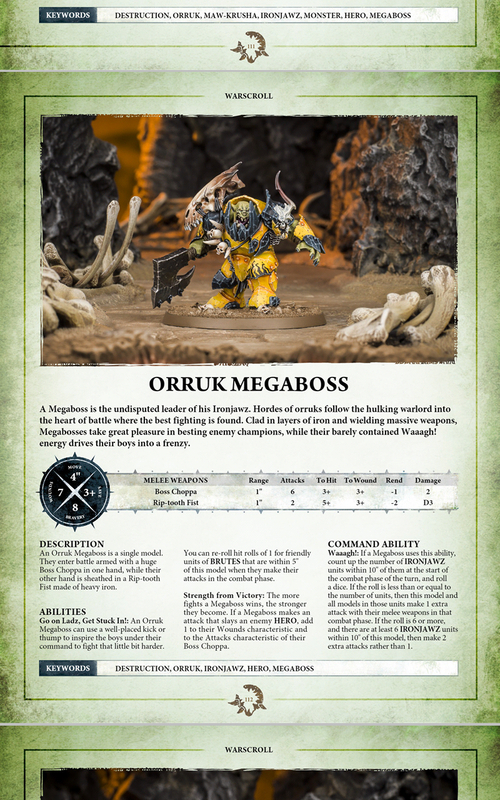 Keep them near to a Megaboss on foot and make them a threat for every kind of unit. 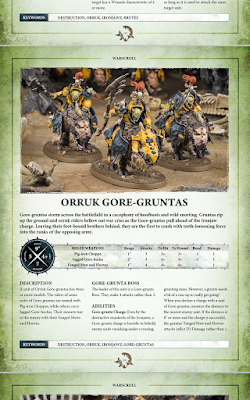 Gore Gruntas are an assurance. You can send them right inside the fire and see them come back; put on a big unit (9 or more) of them +1 to save rolls, and let them invade the enemy territory and enjoy to see how he handles them. 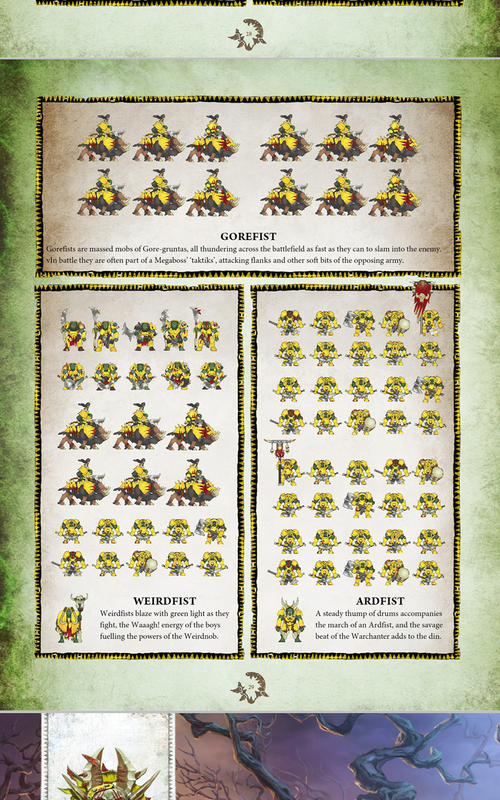 9 of them for example are 45 wounds you can save at 3+ if buffed. 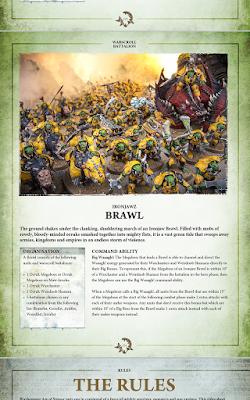 With a Mighty Waaagh! 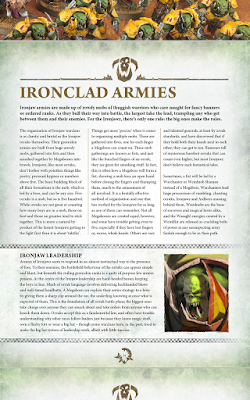 they can reach around one-undred attacks, with warchanter's help making half of them 2+ 3+ and the rest 3+ 4+. 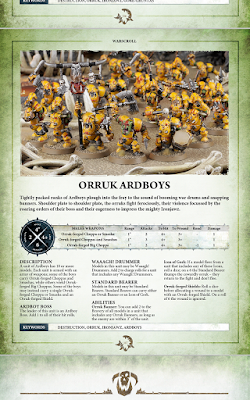 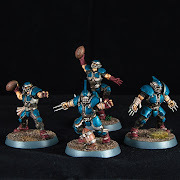 Ardboyz are one of the most cost-effective units I've ever seen. 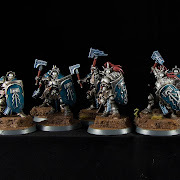 180 points for 10 of them, 2 wounds each, save at 4+ and bravery 8 in CC, providing a banner. 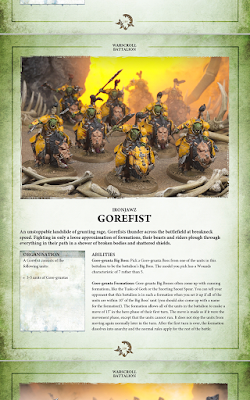 At least 1 unit of them is needed in any Ironjawz Army. 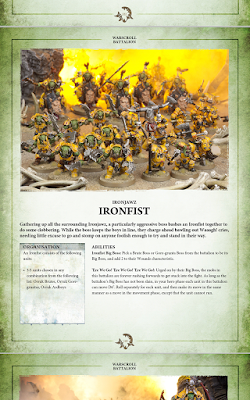 The only tournament and competitive battalion you have is Ironfist. 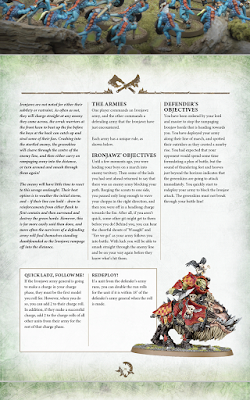 Versatile composition allows you to build the battalion comprising your whole army but the heroes, basically gaining each unit a d6 movement bonus in the hero phase. 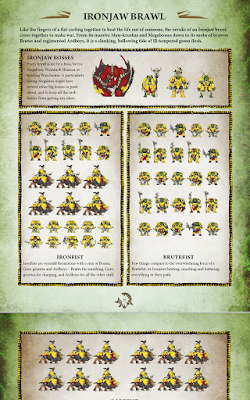 All the other battalions are very enjoyable ways of play, but I suggest to use them in battle for fun. 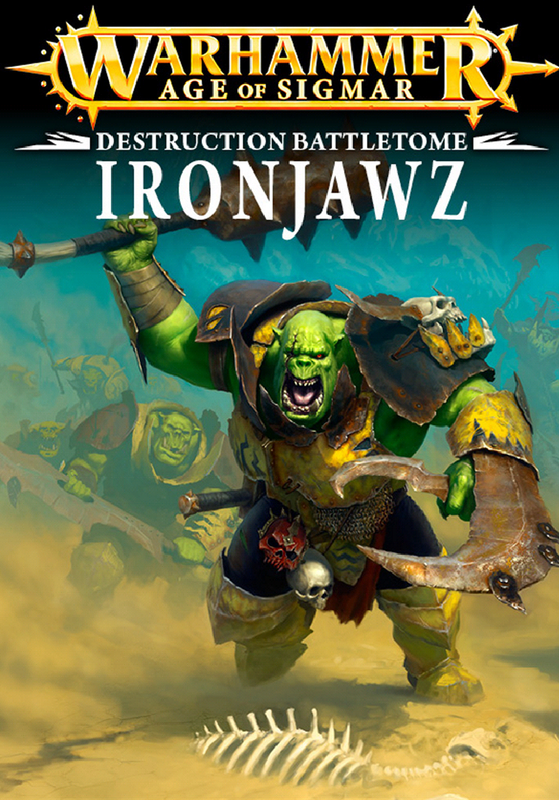 Final Thoughts: Battletome Ironjawz is solid, easy to enter in and very good for insight... rules are quite simple and their way of war is very enjoyable.